Sveta is here today with a new masculine card. 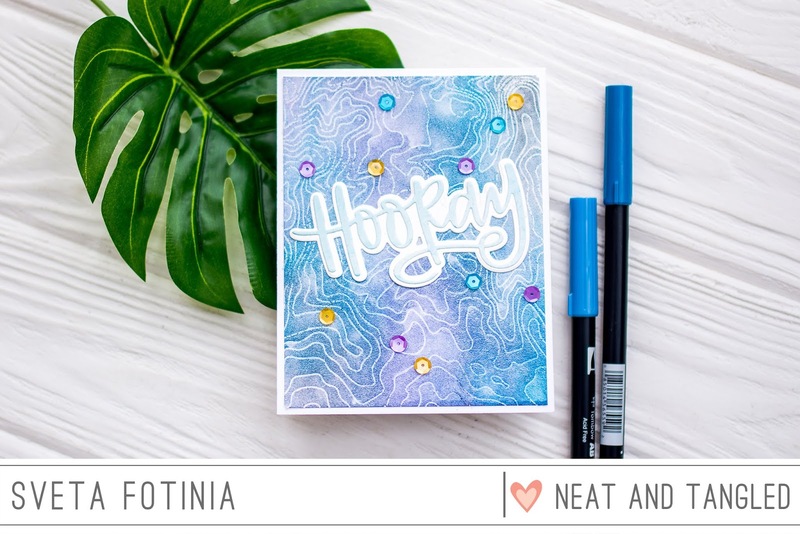 I decided to use a Topography background stamp to create a birthday card for a man. 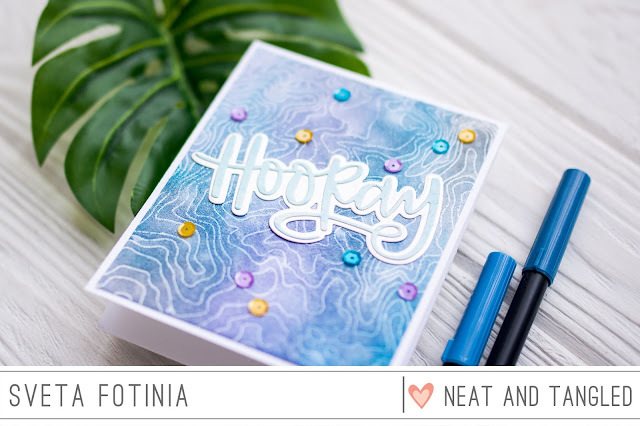 I started with a heat embossing using translucent embossing powder and then sprayed the background with three ink color sprays (purple, blue and silver). 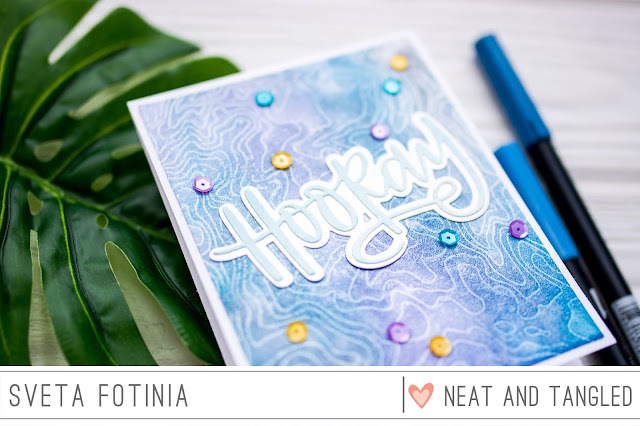 For the sentiment I went with the Hooray Word die set and made it to pop up using white and light blue cardstock. What I love about this die set the most is that the word has matching background silhouette. Especially it is useful with the bright backgrounds. I ended up with adding some sequins . Hope you enjoyed my card today! Have a great day! Daria here, and I have a few cards for you today. I have seen many cards already with Mail background stamp, but I couldn't resist. 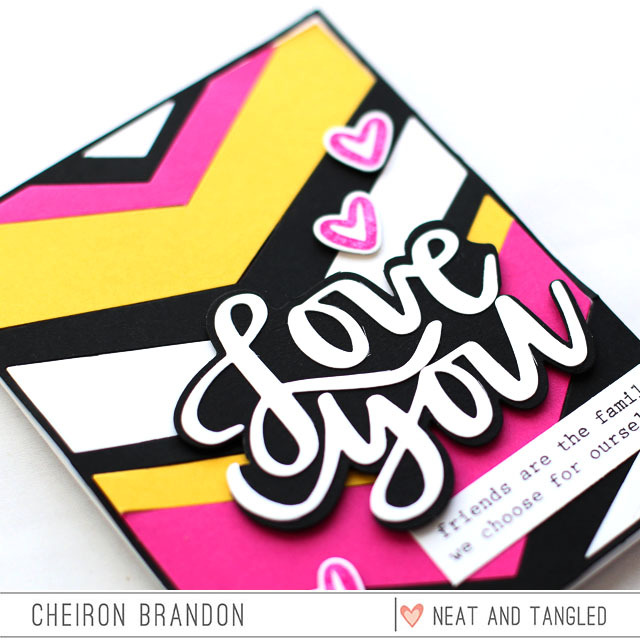 I also wanted to play with Love You dies to create some dipped effect. Let's have a look at those. For the second card, I took an Audrey blue cardstock from Simon Says Stamp and gold ebmossing powder. To add some interest, I also die-cut a bigger heart from Love Mail die set, and foam mounted it slightly off-setting. 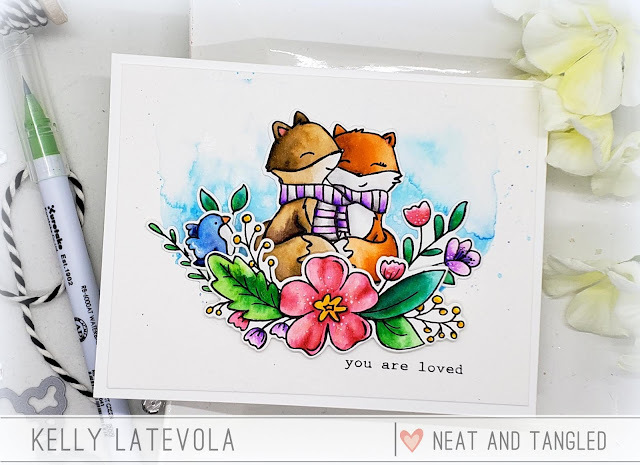 Hello Everyone, Koren here today with another project for Neat & Tangled, featuring the NEW Neat & Tangled Love Mail die set and some of the older Love Notes stamp set. 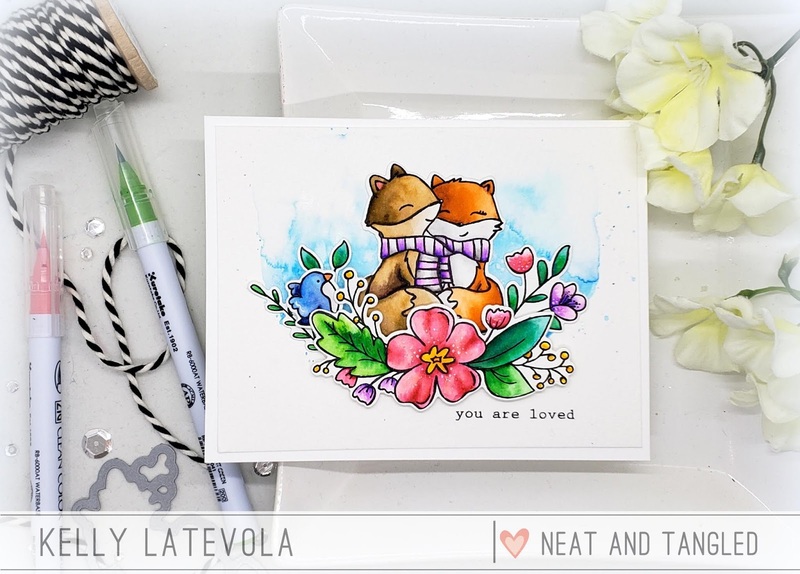 The Love Notes stamp set does have coordinating dies, but we won’t be using those on today’s project. 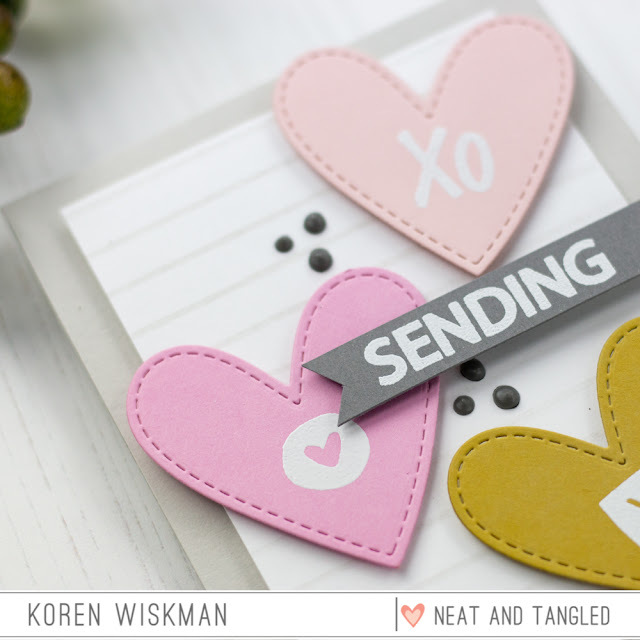 It is a conversation hearts card to send love and x’s and o’s which traditionally mean hugs and kisses. Today, our project starts with a piece of Ranger’s Simon Hurley Create Stark White cardstock. 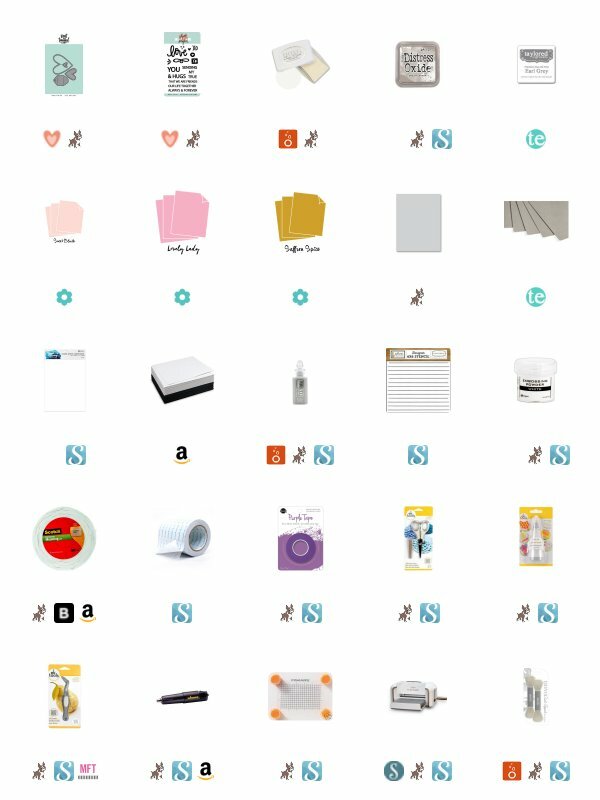 This cardstock is the whitest I’ve ever seen. I cut a piece down to 3 1/2 by 4 3/4. I then pulled out the Carta Bella Shiplap stencil. This type of stencil can easily be recreated using some masking tape and a t-ruler, but the stencil makes it super easy. I’m using Distress Oxide in Pumice Stone and a Nuvo Blender brush to add the shiplap detail to the stark white background. This puts a little interest into the background of the card design. I cut the largest heart from the Neat & Tangled Love Mail die set three times from three different colors of cardstock. I feel like I have been seeing this color combination everywhere and it feels very much like spring to me. 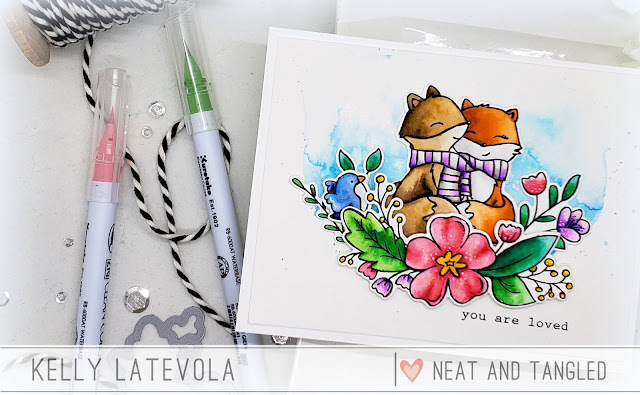 The colors I used were by Papertrey Ink and they are, Sweet Blush, Lovely Lady, and Saffron Spice. I love this color combination. I wanted these hearts to look like conversation hearts that you might see around Valentine’s Day. 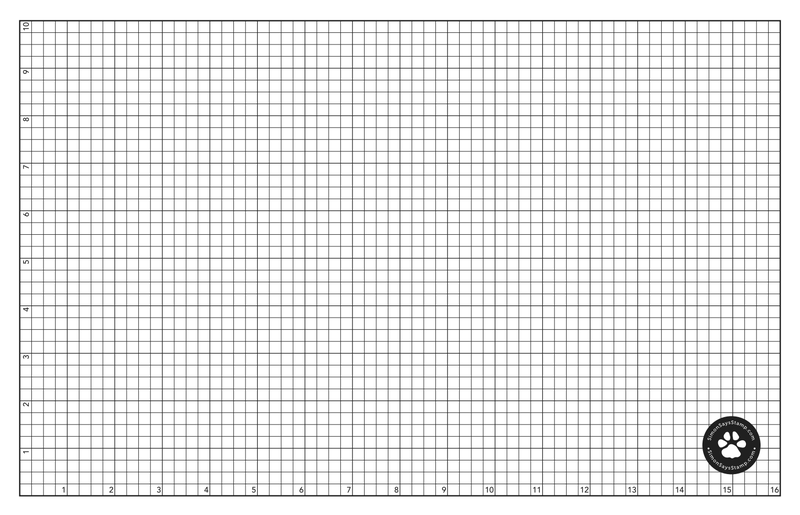 We use to get them in the little boxes and give them out to all of our classmates in school. It doesn’t need to be Valentine’s Day to spread love, in fact these cards should be made all year round. The world could use more love. I used the Love Notes stamp set to stamp the x’s and o’s and the little heart circle. I first stamped them with Nuvo Clear Mark embossing ink and then heat embossed them with Ranger White Embossing Powder. 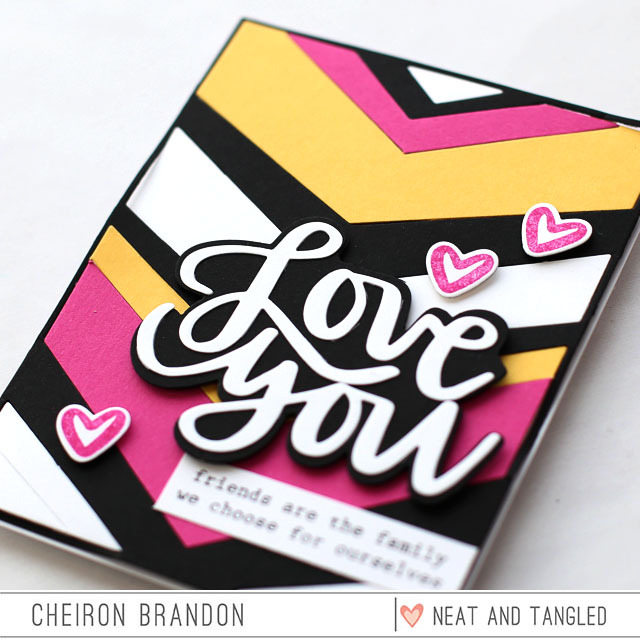 These three hearts were then arranged onto the shiplap background using Scotch 3M foam tape to add dimension. 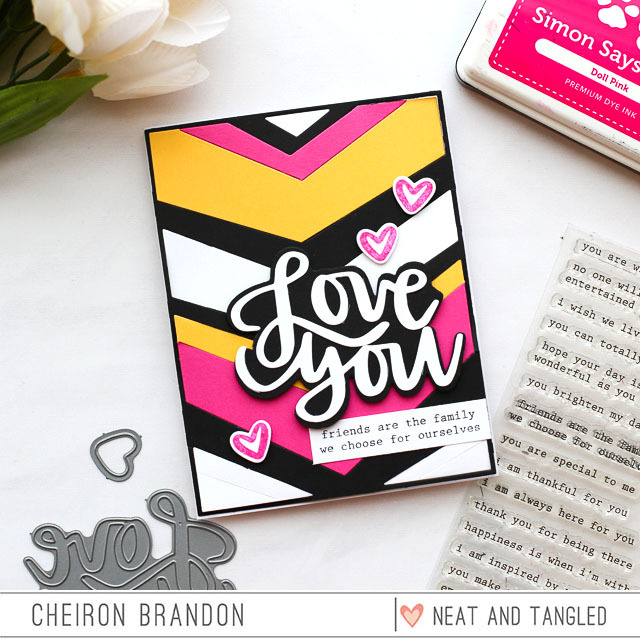 I saw the cluster of dots stamp from the same Love Notes stamp set and want to scatter them on my project. I used Taylored Expressions Earl Grey ink to do this. I didn’t really love how it looked, so I went back over them with Nuvo Earl Grey Vintage Nuvo Drops. How many times do you think I can have Earl Grey in this blog post? I didn’t love how it looked but upon further inspections, to me, it looked like little pieces of chocolate, so I kept them. To add the sentiment, I took some Taylored Expressions Earl Grey (last one, I think) cardstock and stamped the “sending” stamp from the Love Notes stamp and heat embossed it to match the rest of the card. I trimmed it down with my Fiskars Wire Guide trimmer and cut a little fish tail banner in one end. It too was popped up with foam tape and any excess that was off the edge of the card was trimmed off. The entire panel was added to a piece of Simon Says Stamp Fog cardstock with white craft foam added to the back with Scrapbook.com double sided adhesive. That is it. I really love the color combination on this card. I think it’s perfect for sharing love all year round. Hello there and welcome to the Neat & Tangled blog! Janette Kausen here with my third and final guest post for February (sad panda). 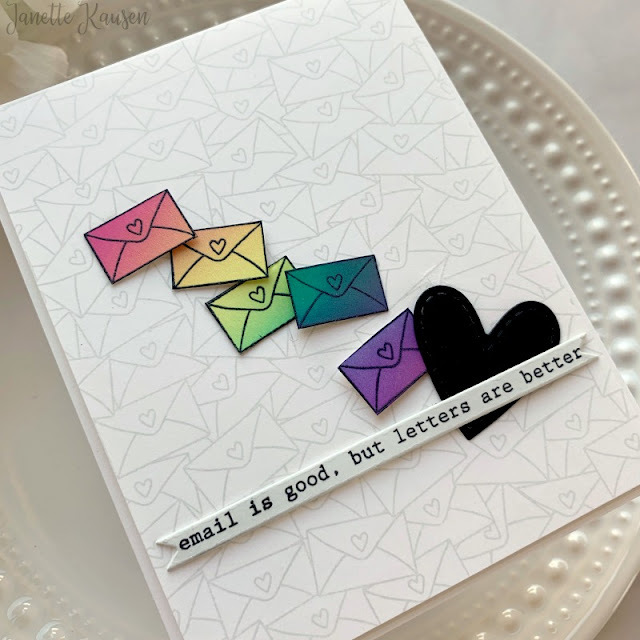 Today’s project features the darling Mail Background, Love Mail Nice and Neat dies and a rainbow of ink blending. Who wouldn’t love that?!? Bring on spring! 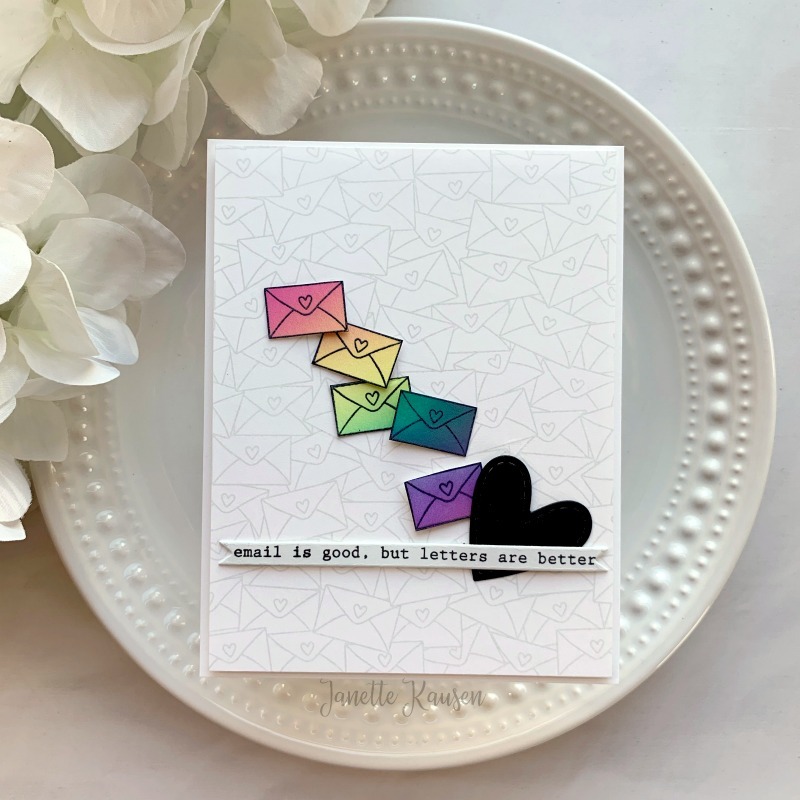 To create this card, begin by stamping the Mail Background in a light grey for a subtle design on a scant A2 white cardstock panel. Stamp image again on a 6” x 6” panel in black and heat emboss clear. Then, ink blend panel with Distress Oxides in Picked Raspberry, Squeezed Lemonade, Peacock Feathers and Wilted Violet. Fussy cut several full envelope images from blended panel. 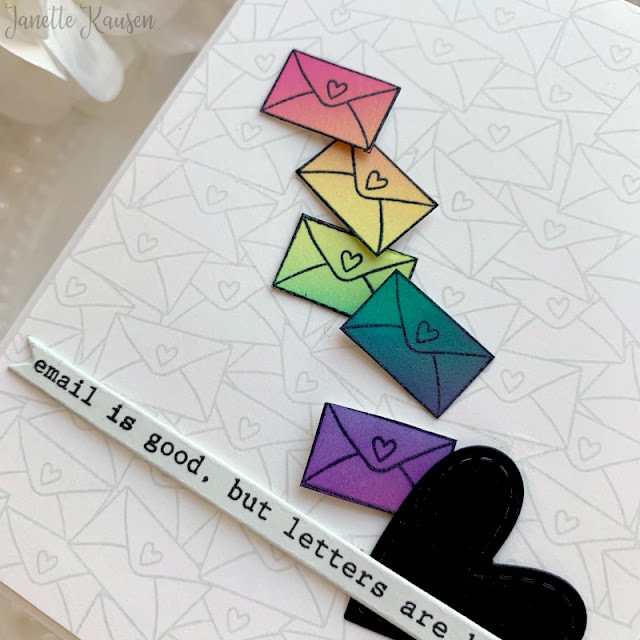 Die cut a sassy black heart from Love Mail Nice and Neat Dies and adhere to panel with a trail of rainbow envelopes. Pop corners here and there with dimensional adhesive for detail. Stamp Typed Sentiment in black on an inked grey Skinny Strip Nice and Neat Die and pop in place. Adhere finished panel to an A2 card base. Thank you for visiting today and thank you to Neat & Tangled for the guest invitation. It’s been a pleasure! 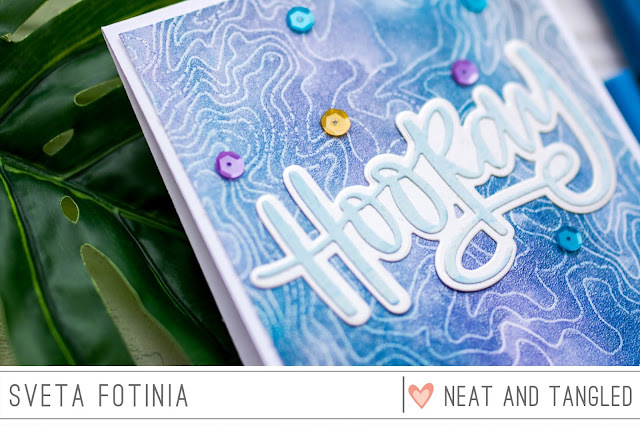 Keep tuning in to Neat & Tangled for amazing releases and inspiring designs from their incredible creative team! I cut the Love You out in black and white and adhered it to my card with foam tape, as well as a few little hearts from the Just Because stamp set and finished the card off with a sentiment from the Typed Sentiments set...this sentiment is one of my all time favorites, I've been putting it on everything! Lately I've been all about pushing my self to do different things because sometimes I feel like I get a crafty rut. One of the things I think contributes to that is that I don't usually use different mediums. With that said today there isn't a drop of copic ink to be found on my card. And I still like it! I haven't used my Zig Clean Color markers in probably like 6 months. In fact I had to search around my craft room because I couldn't remember exactly where I had left them. The big reason I don't typically use them is because I struggle with the shading. It's never dark enough for me. Then I said to myself, "Kelly, it's never gonna be if you don't practice." I used the zigs for all of the coloring including the background. Taking my time and being willing to add extra layers made a ton of difference for me. Also, it's all about the water. These things love water so I found if I used as little as possible I got much better results. You can see all the painting and the rest of the card too in the video below. Most of my struggles had to do with a lack of patience on my part. I need to work on accepting that each medium has something different to offer. I could never get those beautiful color blends with copic markers and I absolutely adore them. The way the water mixes the colors just isn't something you can recreate! 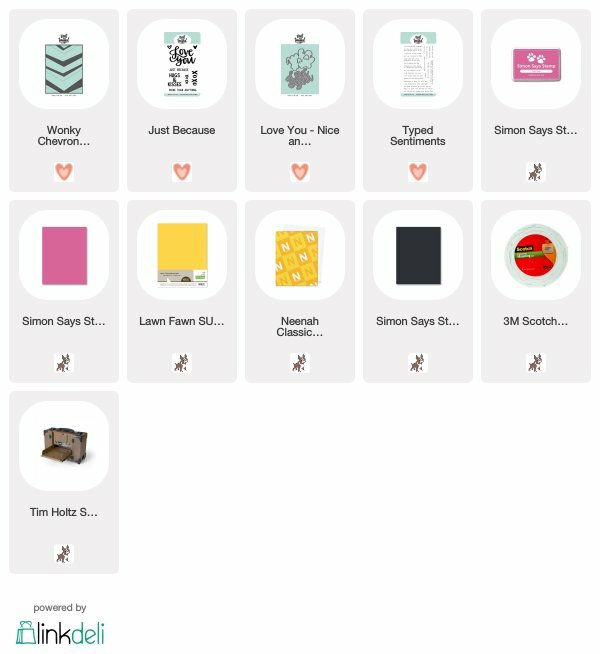 February 2019 Release Week Wrap Up!